Here's a garden for you. Let's call it an acre, plopped down in the middle of a broad expanse of ballfields at Smoyer Park. This, too, was mowed turf until last year, when Partners for Fish and Wildlife, partnering with the town of Princeton and the Friends of Herrontown Woods, converted it to a native wet meadow. Normally, these conversions, if they can be said to be normal at all (given that the vast majority of detention basins in New Jersey are curiously barren depressions in the landscape, a sort of make-work program for mowing crews) would involve a plant-and-run approach. The turf would be killed and disked, the native grass and wildflowers scattered, followed by a couple years of wait and see. In my experience, though, the first two years are defining, a time when attention should be paid, lest the weeds gain the upper hand. The power of aggressive, mostly nonnative weeds to invade can be seen in countless backyard gardens and utility right of ways taken over by the likes of mugwort, canada thistle, crown vetch, and a host of others. The seeding of the basin came in spotty, leaving expanses of bare dirt. What fills that void determines the botanical fate of this wet meadow. There's gardening to be done here, wild gardening, like backyard gardening but on a grander scale. Can it be said that delinquent landscapes, like delinquent children, are saved only by a finer vision of what they might be? That vision may be weak within the child or landscape, but if it resides as well in someone who cares, as a kind of empathy, its transformative power can in time take wing. Thoughts like this bring back vague memories of a book by Eric Fromm. For the detention basin, that vision is fed by all the marshes and swamps and swales I've ever seen, one of which lies just down the hill from the basin. There, sensitive fern and jewelweed flourish on seepage at the toe of the slope. Soft rush shows off its vase-like, evergreen form. Abetted by favorable hydrology, these grow on their own. The same can be wished for the basin, that early intervention can lead to self-sufficiency. This is the philosophy of schools, but such followup with landscape plantings is considered impractical. The planting is funded. The followup is not. Back in the basin, two legumes sprout. In the foreground is partridge pea--a delayed sprouting from the original seed mix. It stays where it's planted. In the background, crown vetch, an aggressive nonnative that would spread and grow over the intended species. Here's another crown vetch. What a pleasure it is to be able to weed it out in this early stage, before it becomes a tangle of despair. as it has in so many places in town. In this garden, for example, in the Jugtown district of Princeton, the frontyard garden got invaded by Canada thistle, and the next thing you know, the house has been entirely gutted. Cause and effect? Never underestimate the power of a weed. Other weeds in the basin may or may not pose a threat of longterm dominance. There's the fragrant Pineappleweed, rare in Princeton and perhaps a hitchhiker in the seed mix. And a plant that makes discreet, silver green pincushion shapes, more reminiscent of a desert landscape. Along with the weeding, seeds of local native floodplain wildflowers have been raked into the bare ground, and some softrush, sensitive fern, rose mallow hibiscus, buttonbush, and cutleaf coneflower added. Some of these were later found pulled out, perhaps by the deer, to which I responded by replanting them close to other plants that might better disguise them. Even with the deer causing some setbacks, wild gardening at this stage is satisfying, requiring relatively little work to achieve considerable longterm effect. People passing by, out for an evening walk or headed to their plot over at the community garden nearby, stop and show an interest. Some even offer to help. The peacefulness of the park, the light work amidst leisure, the green all around and big sky above, all this is good for the soul. Informed followup is a given in most fields of care for living things, but somehow native plantings in public spaces have been expected to fend for themselves. We'll see how this interplay of living thing and vision plays out. This Monday, May 22 at 7pm, the Princeton Public Library will host a presentation on invasive species in Princeton by Mike van Clef, of the NJ Invasive Species Strike Team. There will also be representatives of FOPOS and DR Greenway participating. Princeton municipality hired Mike to develop a report on invasive species in Princeton preserves, and in 2016 he and two interns worked through the summer on invasive species control. Because of the massiveness of the problem, they focused on emerging species--those whose populations are still small enough that a summer's worth of control would make a difference. We may look back on 2016 as a pivotal year, when the town began investing in invasive species management, much as 2000 marked the beginning of professional deer management in town. Although it may sound self-congratulatory, another important date in Princeton's history of invasive species management would be 2006, when the Friends of Princeton Open Space hired me as their first Natural Resources Manager. When I arrived in town in 2003 on the coattails of my wife's appointment to the Princeton University faculty, a couple things quickly became obvious. First, Princeton had done wonderful work preserving land for open space. Second, the open space itself needed a lot of work. Though the trees in Princeton's woodlands were mostly native, the understory vegetation was often dominated by nonnative, invasive plants. Stiltgrass, honeysuckle and privet, to name but a few, had filled the void created long ago when the diverse native understory had been plowed under, back in Princeton's agricultural era. In the decades since, the native trees had rebounded, but the understory had either not come back, or succumbed to heavy browsing pressure from deer. Because wildlife tend not to eat the leaves of nonnative plants, their proliferation in preserves renders the habitat largely inedible. Yes, birds can eat the berries of nonnative shrubs like honeysuckle, but if the insects and other wildlife aren't eating the leaves, then much less of the solar energy captured in the plants can move up the food chain. I proceeded to make the case that Princeton could expand its effective acreage of open space through management for native species. As most readers know, I've been leading workdays and nature walks ever since, for six years as an employee of FOPOS, and more recently as president of the Friends of Herrontown Woods (FOHW). Highly motivated volunteers like Tim Patrick-Miller and Andrew Thornton, and more recently Kurt and Sally Tazelaar at Herrontown Woods, have had a positive impact over time. Meanwhile, FOPOS has sustained its Natural Resources Manager position--having just hired the fourth to hold that position--and continues to do invasive species removal at Mountain Lakes Preserve. After so many years of nonprofit, largely volunteer efforts, to finally get municipal support through Mike's crew this past summer was a real boost that we hope will continue. It's important to note that Mike van Clef's study of invasive species in Princeton is limited to parks and preserves owned or managed by the town. There are large expanses of open space owned by the state (Princeton Battlefield and DR Canal) and by the Institute for Advanced Study (the 600 acre Institute Woods). Portions of the Battlefield and the DR Canal are being overrun by porcelainberry (in photo), which barely registers in Mike's survey, and mile-a-minute vine is beginning to show up there as well. I've been trying to help fill a void in management, co-leading workdays at the Battlefield and, in the proactive "early detection, rapid response" tradition, dealing with two small infestations of Mile-a-Minute in town before they become unmanageable. Another nonnative plant that's spreading rapidly, both in people's yards and in nature preserves, is lesser celandine (a.k.a. fig buttercup). It can only be controlled in the spring, long before summer interns begin work. Ideally, a town-wide coordination to manage invasive species would be developed. The town's investment in invasive species control comes at a critical time. With the emerald ash borer (another highly invasive introduced species) poised to decimate Princeton's most numerous native tree, large gaps will be created in our forest canopy, allowing light to penetrate to the understory. Princeton's long investment in deer culling has allowed native shrubs like spicebush to make a comeback, but in many woodlands, the understory is dominated by nonnative shrubs and stiltgrass. Wildlife have evolved over millenia to eat native species. It's a question of whether edible natives will capture that extra sunlight in the understory, or the privet, winged euonymus, honeysuckle, barberry and Photinia. The foodchain depends on our intervention. The primary argument for habitat management remains that, by improving the quality of habitat, Princeton effectively increases the functional acreage of open space. This is true not only for wildlife but also for people. Controlling invasive species also makes the human experience in preserves more rewarding. As we've cut down invasive shrubs at Herrontown Woods, we've not only made more sunlight, water and nutrients available for native species to prosper, but also have opened up pleasing vistas and made the woods more navigable. The problem of invasive plants may seem overwhelming, but we can take our inspiration from the deer, who transform landscapes through the cumulative impact of browsing here, there, and everywhere, one mouthful at a time. The pioneers, too, thought the continent too vast to ever tame. Though their goal wasn't exactly to increase native plant diversity, they showed how steady effort makes a difference over time. Ideally, professionals will complement existing volunteer efforts, and the locals who know the preserves best will help steer the professionals' interventions. At Monday's presentation, there will also be discussion of a list of invasive species that people are being discouraged from planting. It's a very long list, and I wish it could better reflect the broad spectrum of invasive behavior we see in the field. One reason the list is so long is that, though many of the species on the list may not be found spreading into Princeton's nature preserves, history shows that invasive behavior in nonnative species may not become manifest until many decades after they've been introduced. Chinese silver grass (Miscanthus sinensis) is a case in point. Though it has yet to spread to Princeton's Tusculum meadows, it is now posing a big problem for meadows at Duke Farms up in Hillsborough. The flyer for the library event includes a photo of butterfly bush, which I've never observed exhibiting invasive behavior. Monday's presentation may help put local observations in a broader context. Update: Full house for the program! Good to see. This past week, as hot weather warmed the ground, cicadas emerged in their clown-like skins, with red eyes instead of red noses. Nature sightings can come in a moment of leisure, and this one came while sitting for a few minutes on the front step Friday afternoon. A few yards away, an adult cicada was crossing the stone walk, as determined as it was awkward, each tiny stick or leaf fragment presenting a formidable obstruction to progress for its bulky body. When it reached the garden bed, it clambered in and around the leaves, finally choosing a spent flower stalk as substrate for its vertical ambitions. With clumsy zeal, it climbed the narrow, flagpole-like flower stalk of a wood hyacinth. As it approached the top, the stem bent, so that by the time it reached the tip, the tip had tipped over and was no longer the top. The cicada, knowing up from down and desiring up above all, turned around and headed back up what moments before had been down. Relieved of the cicada's weight, the tip then straightened back up, leaving the cicada once again below the top. This could have gone on for quite awhile, as if the cicada had been born into a slapstick movie from the Buster Keaton/Charlie Chaplin era, with our frontyard serving as movie set. Numerous on the leaves of the nearby frontyard raingarden were the spent skins from which the adults had emerged overnight. It's a beautiful transformation if you ever chance upon it. Not being an entomologist, I can attest only to what I've read, that since these are emerging in spring, they must be the periodical cicadas--those that appear every 13 or 17 years en masse--a phenomenon unique to eastern North America. Annual cicadas, by contrast, emerge in summer and are found worldwide. Perhaps the cicada, so intent on climbing, was seeking a good perch to sun itself, the better to harden its exoskeleton over the next few days. We'll see if all this clambering gives rise to a great clamor in coming weeks. A cool, rainy weekend for Mothers Day is good news in our backyard, where I planted a Rhododendron rescued from the foundation of a house not long for the world. It's hardwired in me to rescue all manner of abandoned items, to see potential in discards. That concept can be applied to anything from furniture left at the curb, to a house left boarded up in the woods, to the earth itself, which is being treated like a disposable oasis in the universe. A camera rescues images from oblivion. This blog fashions fleeting experiences into something lasting. The Rhododendron and its timing were particularly serendipitous, because it's my wife's favorite plant in all the world. Other outdoor plants come and go, but the deep connection she feels for Rhododendrons brings joy when they prosper, and sorrow when they struggle. I managed to get this one in the ground on Friday, making the weekend's rain something to celebrate. We'll see if it endures, but at least in the short term, I've scored major spousal points. Thanks to Nicole Bergman for most of these photos of a walk at Princeton's Herrontown Woods this past Sunday. The Friends of Herrontown Woods, which I proudly lead, has for the past four years been living up to the expectations stated by the Veblens when they donated this first nature preserve to Mercer County in 1957. The deed calls for "the maintenance of a park, wildlife, and plant sanctuary", and "the stimulation and development of public appreciation of the values of wildlife and plants." Though these are maintenance and education responsibilities the county took on when it accepted this unprecedented gift, we have been doing the work gladly as an expression of civic spirit and love for the charms of this preserve--its intact ecology and fascinating history. Many of those who came on the walk wanted to hear the latest on our initiative to extend our stewardship to the Veblen House, cottage, barn, corncrib and garage, which also were gifted to the county for public use. The Veblen will states that the house is intended to be a "museum and a library of Herrontown Wood". As with care of the preserve, our nonprofit is ready to fill the void in building stewardship as well, and insure that the buildings continue to be safe and meaningful landmarks in the landscape. With community support, which has already been considerable, we aim to make the Veblen House useful as interior space--a much-needed gathering place in eastern Princeton. The county's rejection thus far of this initiative, and its frightening move towards demolition, has been surprising in its dismissiveness. For whatever reason, the county chose long ago to put its resources elsewhere than Herrontown Woods. One would think that the organization that filled the resulting void in stewardship, without any government support, would be due respect and gratitude. It's one thing to give short shrift to the expectations stated in will and deed, but another to aggressively oppose those who, in the county's absence, want to realize the Veblens' vision. The first part of the walk was led by Nicole and Jeff Bergman's son, Jensen, who for a public service project has been helping us build a short loop trail next to the parking lot. We had been thinking of building the trail, but it was the Bergmans' infusion of energy and interest that catalyzed action. Jensen explained that the trail will be a miniature "intro to Herrontown Woods", with plant identification aids, and descriptions of the various habitats the trail moves through. He then showed us the tadpoles and other creatures living in a couple vernal pools near the trailhead. Jack being the spadix under the hood or "pulpit". You may remember seeing a spadix in the Peace lily, a popular house plant that's also in the Araceae family. Wild geranium. Not sure what the linear leaves are that surround it, but they meld nicely into the trunks of trees in the background. Rue anemone, although it may be more fun to say its scientific name, Thalictrum thalictroides. If you look closely, you'll see the wings on the stems of this winged euonymus, and also a spot where the deer have been browsing the new growth. Winged euonymus, a nonnative species common in landscaping as "burning bush", has taken over whole hillsides at Herrontown Woods. Like many species that evolved in other climates on other continents, it leafs out early in the spring, casting shade on spring ephemeral wildflowers that need the sunlight to recharge their roots for the next year. Because the deer and insects don't eat the foliage, we've stepped in to serve the role of herbivores, cutting the shrubs down to restore some balance to the forest. Fortunately, the deer have been helping to some extent by eating the fresh resprouts, which perhaps lack the toxins that discourage browsing of older tissue. then headed to the quarry area. Jensen, demonstrating some mountain goat climbing agility, pointed to a section of diabase boulder ("trap rock") that long ago had been quarried but then left behind. If you click on the photo to see a larger version, you can see the marks along the edge of the main boulder where they hammered in pegs to cleave the rock. That's yours truly showing everyone an alternate-leaved dogwood, of which only two are known to exist in the park. The more common Flowering Dogwood has opposite branching. The rarity of the alternate-leaved dogwood may have to do with its susceptibility to golden canker, which particularly infects drought-stressed trees. Perhaps these two specimens have held on due to favorable hydrology where they grow. We then headed over to Veblen House, which serves as a landmark to head towards and gather next to for refreshments and socializing. It's common to think of buildings as useless unless they are made habitable, but we view the Veblen buildings as an inspiring and enchanting presence, useful even now, in their unrepaired state. Four out of five are all already safe and stable. The notion that one has to spend $600,000 to make these buildings useful, as alleged in a recent frontpage Town Topics article on the buildings, has no basis in the realities we've come to know and love through our years of service to the public and the Veblen legacy at Herrontown Woods. Note: Thanks to the Bergmans for their help, and the photos in this post. Another nature walk the day before at Herrontown Woods is written up at the FOHW.org site. Back in the 1980s, while I was accumulating credits for a masters degree in water quality at the University of Michigan, I did some academic moonlighting and took an "expository writing" course taught by Alyce Depree. She had us adopt pseudonyms (mine was Snupulus Lupulus), fed us a steady diet of George Orwell, and had us write and rewrite 2-page essays. It was a wonderful, validating experience. Last summer, heading back to Michigan to play a jazz festival, I reconnected with her. Out of the blue, she told me the inspiring story of her long but successful battle with garlic mustard--an introduced species that has displaced trilliums and other native wildflowers in the woodlands where she lives in Holland, Michigan. She later wrote up an account of her experience. I'm posting this when just a few blooms remain, but you should still be able to find it growing along the fringes of your yard, or in a woodland nearby. Perhaps you'll be moved to action, in your yard and beyond, as Alyce was many years ago, with heartening results. Hi, Steve...You've caused quite a chuckle here this morning...so few people for so long cared about what was occurring in their woods on the west side of the state that my cousin and I spent almost as much time encouraging ourselves not to give up as we did actually picking! The tables have turned (mixed metaphor), however...now in the spring the local churches (of which there are many) organize their congregants and Sunday school kids to go over various ground areas and parks in the Holland area...that is making quite a difference. In my cottage area along the lake, and my cousins', we noticed sixteen years ago that our lovely banks of trillium in the woods simply no longer appeared in springtime. What we had instead was this aggressive leafy plant with cute little white blooms that grew higher and higher during the spring until, by June or so, could be four feet tall and going to seed...it almost looked like phlox, except that the blooms were single, not developed into bunches or clumps. So we did some research, and discovered what it was called and how it was edible (yuck) and that our venerated forefathers had brought it with them from England, mostly, as it would give them something green...and last and last and last. Which it does. It's a two-cycle plant; first year establishes the root, second year establishes and spreads (by "popping" out) the seeds every time wind or an animal comes in contact to move the branches. Each mature second-stage plant can have hundreds to a thousand seeds. It is generally the first plant to begin showing after winter...spreading out quite quickly with many leaves that cut off the sunlight from surrounding and still dormant plants or seeds. Additionally, the root...which resembles a skinny parsnip...exudes a poisonous substance which makes the soil unfriendly to wildflower growth in general AND also strips the protective coating off tree roots...so soil diseases can then attack the trees. We found that, while people can be casual about wildflowers, they aren't casual about their trees; however, they are "terribly busy." Anyway, my cousin and I decided we'd rid ourselves and the immediate area of garlic-mustard. We figured we could do a five or six property area...talked and talked with the owners but didn't really convince them, so then took on the job ourselves. After experimenting with RoundUP and discovering not even that would kill the plants, and learning from internet that the state of Wisconsin had been trying to get rid of them with no luck, we began with local college kids, paid them $12 per hour, lunch, and snacks, and then joined them ourselves, pulling and digging (you have to get the root!) for about ten days. We filled hundreds of 30-gallon black plastic bags with the ill-smelling plants, let the contents rot for a month, and then gradually put them out for garbage pickup. We picked and pulled the five properties for the next ten or so years..."harvest" getting less and less (the seeds last 5 years in the ground)...one owner gets his own grandchildren to pick their woods now...we continue to work four properties and now only get about 15 bags, max. We figure we're down to just maintenance now plus some plants from seeds borne by the winds. The past three years we have not hired anyone to help...just do it ourselves and are glad for the exercise. The trillium is back and glorious. Also a wild yellow ground lily and jack-in-the-pulpits. Amazing how sixteen years flies by....and no chemicals, too. 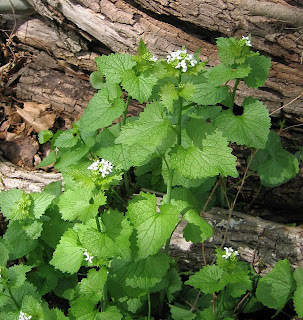 Photo below: Garlic mustard extending into the woodland below Quarry Park in Princeton.